I've dealt with United Access over the years, a company that sells and services wheelchair-accessible vehicles. Good service. Great local people. But like everything made to import into Cripville, wheelchair vans are expensive. A 2013 Toyota Sienna XLE: $63,080. A 2013 Dodge Caravan SXT: $53,075. A 2013 Honda Odyssey EX-L: $61,730. Of course, United Access doesn't entirely control the price of those vans. They're purchased from the manufacturer, and then they are modified by specific companies, one of which is Vantage Mobility International. In fact, I own a VMI-modified van, although it's a 2003 Ford. I purchased it this year, and I paid $14,000 for it. 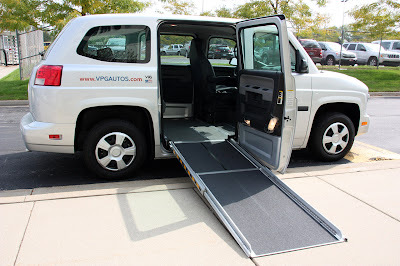 In the last few years, VMI began making a purpose-built wheelchair-accessible vehicle, the MV-1. While I don't know how long and how many were manufactured—I really didn't pay close attention because I knew I couldn't afford one—I learned from a United Access news bulletin that VMI has apparently ceased manufacturing the vehicle. I have no business training. What I know about making a product and marketing it, I've learned from ABC Television's Shark Tank. That said, what mystifies me is how the numbers were crunched to convince a pencil-pusher that this vehicle could be a viable product. Our household has a higher than average total income. We live well. We don't go hungry. We have a nice roof over our heads. That said, there is no way to look at our income and expenses and justify the expenditure of $50,000 for a wheelchair-accessible van. I don't know how many people in the USA are wheelchair users who need a van. But the Department of Labor says there are about 18-million people with disabilities in our country. The department also reports 40% of men with disabilities are unemployed and nearly 50% of women with disabilities have no job. Given those numbers, I cannot see a significant market for a purpose-built wheelchair accessible vehicle. I assume that VMI viewed institutions and businesses and perhaps even taxi fleets as a potential market. What crip would be in the target market? The wealthy, I suppose, either by inheritance, other family income, or by a big bucks settlement from a court case. I have held the opinion for years that it takes big money to live the crip lifestyle. Let's not even talk about life-sustaining items like the $14,000 ventilator. Let's not even discuss the $10,000 to $20,000 required to make a house accessible with ramps and a roll-in shower and, if we're lucky, modified sinks and cabinets. Let's talk about something as simple as a tire tube for a wheelchair. Buy one the exact size through a wheelchair dealer, and it's $21 for single tube. Go to the local small equipment dealer, and there's one on the shelf not quite the right size but usable and it's $7. A tire tube is a tire tube is a tire tube. Care to guess which one I bought after a recent flat tire? It takes big money to live the crip lifestyle, and there's no reason for a person with a disability to be selected only from the upper-income classes. And there's no real answer to the problem. A good start would be improving education certainly, and then the next step would be higher-paying employment opportunities. But that's a long-term goal for a more humane, more inclusive society, a society that produces fewer 1-percenters owning private islands, Cayman Island investment accounts, and assuaging their consciences by funding cures for AIDS and malaria in Africa. I am sad to see VMI stop production of the MV-1 even though I couldn't afford one. The company provided jobs now lost. It means one less company attempting to focus on the needs of the last segregated element of American society. I am sad, but I'm not surprised.